No admission fee. RSVP required to Samuel Gebru: samuelg@cambridgecc.org or 617-500-7456. The Cambridge Community Center, founded in 1929, is celebrating its 90th year of building community together. 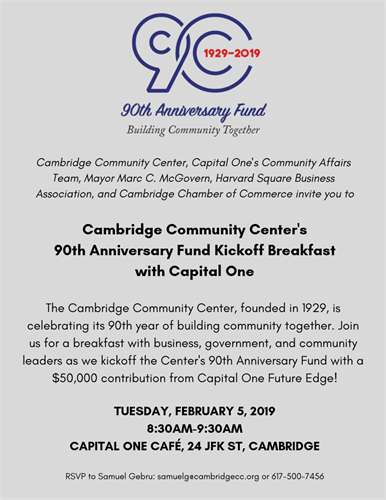 Join us for a breakfast with business, government, and community leaders as we kickoff the Center's 90th Anniversary Fund with a $50,000 contribution from Capital One Future Edge!